Deputy 65 AOS of a 2-story single family dwelling (2675 Knights Road) and reported a light smoke condition on the interior. Engine 65 arrived on location and assisted the Deputy on the interior with a fire that extended out of a pellet stove. Engine 65 extinguished the fire and checked for extension. Quint 28 laddered the exterior of the dwelling and checked for extension. Bensalem FMO is investigating the cause of the fire and no injuries were reported. Engine and Ladder 65 assisted the Trevose FD on February 4th at the Toscana Restaurant on Street Road. Deputy 4 established command and reported a fire in the kitchen that extended into the ductwork. The restaurant was evacuated and the fire was quickly extinguished. 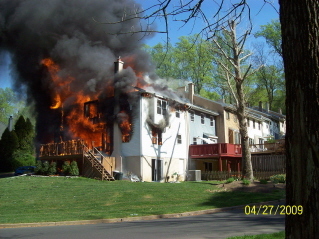 Bensalem FMO was on location to investigate the cause of the fire. No injuries were reported, the restaurant was forced to close due to damage. Deputy 65 AOS of a 3 story apartment building andreported smoke showing and numerous victims hanging out the 2nd and 3rd floor windows. Engine 65 was first in and dropped a 5" supply line and stretched 3" to a courtyard pack to the interior. Asst. Chief 28 arrived on location established command and struck a 2nd Alarm. Tower 16 and Ladder 65 laddered the building and removed numerous victims from the 2nd and 3rd floor windows (Bensalem PD assisted other residents out of the building via the stair towers). Interior crews (Engine 65 and DC65) encountered a heavy smoke condition on the basement level and located the fire in apartment 14. Ladder 65 crew performed a primary and secondary search (negative results). The fire was knocked down by Engine 65 and contained to apartment 14 and the 1st floor hallway- Crews from 28's, 37's and 44's check for extension on the 2nd and 3rd floor (negative results). 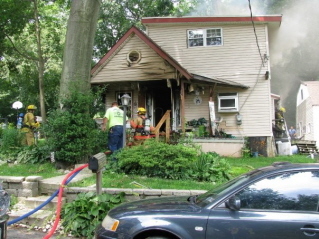 Bensalem Fire Marshal's Office (FMO) was on location investigating the cause of the fire. The Bucks Co. Red Cross assisted with setting up a Shelter for approximately 50 displaced residents of Building D.
Crews dispatched for an apartment fire with possible entrapment. FM 252 (Harris) AOS and reported heavy fire showing from side C of a 3 story garden style apartment building. Deputy 65 (Sponheimer) placed 1 and 1 in-service. Engine 65 established a water supply and quickly knocked the fire down with an 1 3/4" waterline. Ladder 65 assisted interior crews with a search and laddered the building. Assignment held to 2 and 2 - Bensalem FMO on location to investigate the fire. Engine 65 along with other Bensalem Twp. Companies were dispatched to assist Lower Southampton FD late in the afternoon for a 2-alarm townhouse fire on Pebble Ridge Ct. Engine 65 remained on location for approx. an hour. Chief 44 arrived O/S , one (1) story single family dwelling with heavy smoke showing. Interior crews reported heavy fire in the basement with extension into the first floor. E44, E88, E16, Q28 were put into service, L65 R8 & R9 (RIT) were then added. Upon arrival L65 split it's crew ventilating the dwelling and assisting the engine co's. The cause of the fire is under investigation by Bensalem FMO and 22pd. 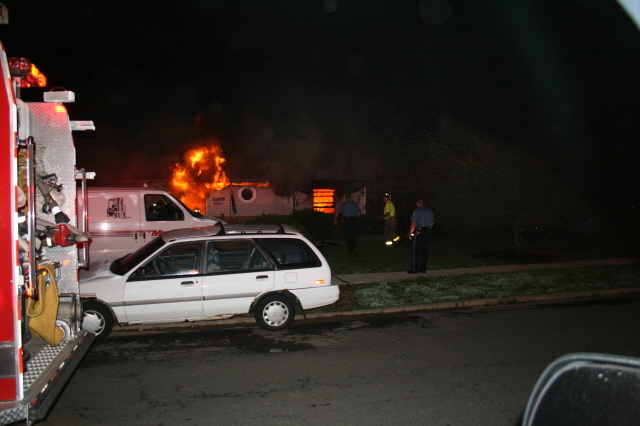 Engine 65 was returning from a run at approximately 0200 hrs on Sunday May 24, 2009 when the Bucks County Dispatch Center advised the Engine of a dumpster fire in the 2800 block of Century Lane. 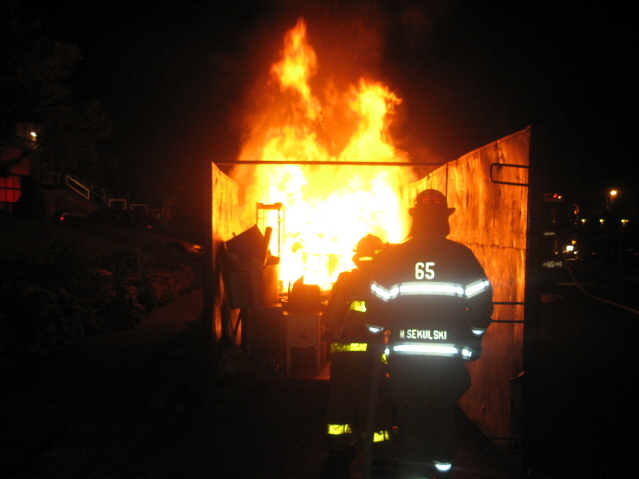 Engine 65 AOS and reported a fully involved 40-yard dumpster with no exposures. Engine 65 dropped a 5" supply line and went in-service with an 1 3/4" waterline and hooks. The Engine Company was in-service for approximately 30 minutes. Bensalem FMO is investigating. Assistant 16 AOS of a 2 story tax payer and reported fire showing Side A. Engine 16 went in-service with an 1 3/4" waterline. 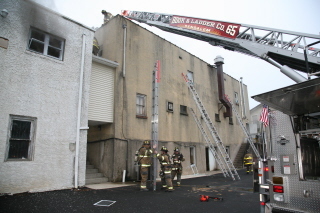 Ladder 65 took Side C (rear was 3 stories) and laddered the building, forced doors, and performed a primary search of the second and third floors (negative results). The fire was contained to the restaurant with limited extension to the apartment on the upper floors. Bensalem FMO and PD were on location for the investigation. Chief 6 AOS and reported fire showing from a detached two car garage. 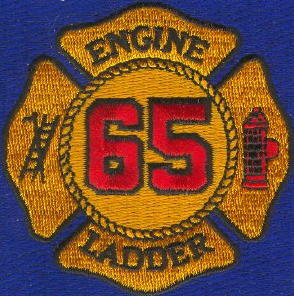 Ladder 65 was the first in piece of apparatus on location and went in-service opening up the garage. Engine 1 arrived pulled a 1 3/4" waterline and went in-service. The bulk of the fire was located in the attic of the garage and an additional hand line was pulled to assist Engine 1's crew. Engine 4, 6 and Medic 114 were on location and assisted. Lower Southampton FMO on location for the investigation. Engine 84 AOS of a 2-Story single family dwelling with fire showing from Side-D. Engine 84 went in-service with an 1 3/4" waterline - Deputy 65 established Trevose Command; Engine 4 assisted Engine 84 crew with an interior attack while Engine and Ladder 65 vented the dwelling and conducted primary and secondary searches. Engine 6 and Rescue 9 crews were used for manpower. Bensalem FMO and Police were on scene to conduct the investigation. Deputy 65 AOS of a 1-story single family dwelling and reported heavy fire showing from Side A. Engine 65 went in-service with an 1 3/4" waterline , Ladder 65 vented and conducted a primary and secondary search of the dwelling. Interior crews reported heavy fire conditions on the first floor and attic but were able to quickly knock the bulk of the fire down. Engine 4 established a water supply and Rescue 8 assisted the truck company. Investigators from the Bensalem FMO and Police are investigating the fire. 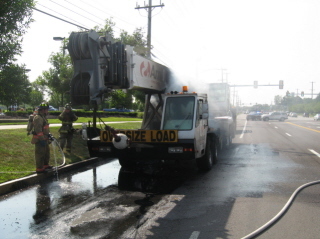 Engine 65 responded to the 3000 block of Street Road in the area of the Applebees Restaurant for a Crane Fire. DC65 AOS and reported an AmQuip Crane on fire in the westbound lanes of Street Road. Engine 65 went in-service with an 1 3/4" waterline. Utility 65 and HazMat 37 assisted with hazard control due to the large amount of fuel on the highway. The westbound lanes of Street Road were closed for nearly three hours because of the damage to the highway. 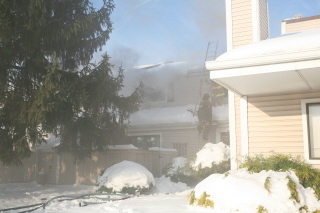 On Sunday afternoon, Ladder 65 was added to a working structure fire at 1066 Cornwells Avenue. Chief 16 AOS and reported smoke showing from a 2-story single family dwelling. Engine 16 went in-service with two (2) 1 3/4" waterlines. 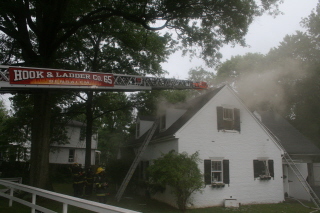 Ladder 16 vented the dwelling and Engine 28 assisted Engine 16's crew. Ladder 65 set up on side B of the dwelling and put numerous ground ladders up and assisted with the searches and checked for extension on the 2nd floor. Bensalem FMO was on location for the investigation. Engine 65 was dispatched to Old Lincoln Hwy (In the rear of the Raddison Hotel) with station 4 for an auto extrication. E65 & R4 went in service with a door pop and assisted EMS with patient care. Shortly before noon on Monday Engine 65, Engine 4 and Rescue 9 were dispatched for a report of an auto extrication at the Philadelphia Interchange of the PA Turnpike. Engine 65 AOS and confirmed one subject heavily entrapped in a Dodge Van. Engine 65 went in-service with removing the passenger side door and controlling the hazards. Engine 65 and Rescue 9 with the assistance from Engine 84 removed the roof and pushed the dash to free the victim from the wreckage (the extrication took approximately 30 minutes to complete). Chief 65 AOS reporting smoke showing from the roof of a two-story apartment building and established Nottingham Command. Command had Engine 65 go in-service with a 1 3/4" waterline and Ladder 65 go to the roof to ventilate. Deputy 65 (interior command) reported the Engine Company knocked the bulk of the fire and had minimal extension to the attic. 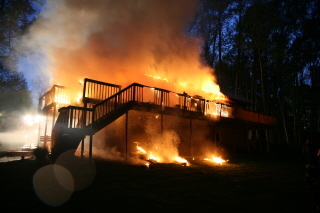 The fire was placed under control and FM 222 was on location to handle the investigation. 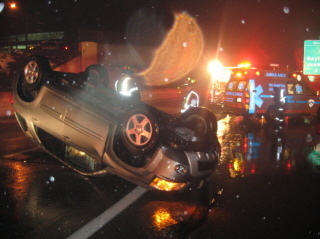 Engine 65 AOS reporting a one vehicle rollover accident with one occupant entrapped. E65's crew went in service with cribbing and stabilized the vehicle allowing the driver to self extricate himself. The patient was transported by Medic 114. Rescue 4 and Montgomery County Squad 10 were also dispatched on the assignment but recalled prior to arrival. Chief 16 AOS and reported smoke showing from the roof of the church. Engine 16 picked up a hydrant and stretched an 1 3/4" to the first floor. 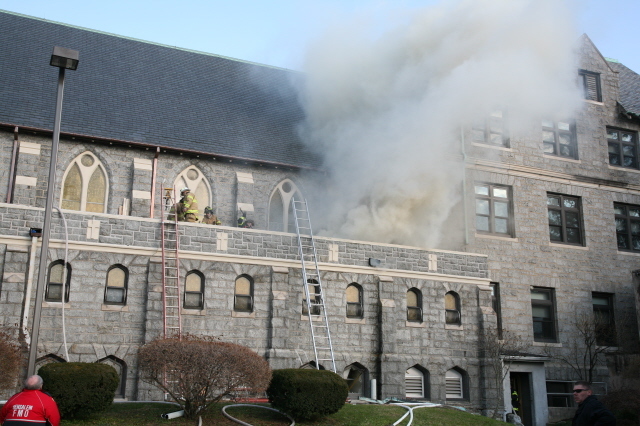 Engine 65's crew along with Chief 65 (roof command) went to the roof of the church and began to ventilate the building. 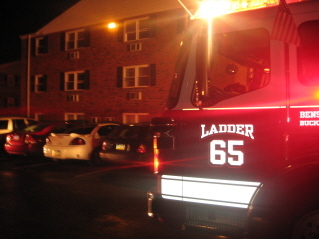 Ladder 65 arrived shortly thereafter and went in-service in the interior. Deputy 65 (interior command) reported heavy smoke conditions on all levels of the church and fire running the ceiling on the second floor. Chief 65 requested additional manpower and saws to the roof (Ladder Co's 16 and 8 assisted). Engine Co's 16, 37, 44, 28, 88 assisted with the interior operation. Bensalem FMO was on location for the investigation.